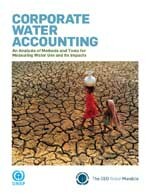 Effective business water accounting methods are critical for sustainable water management, according to the new Pacific Institute report, Corporate Water Accounting: An Analysis of Methods and Tools for Measuring Water Use and Its Impact, prepared for the United Nations Environment Programme and the CEO Water Mandate. Current methods are a good start for measuring water use and impacts, but they are inadequate for benchmarking. Advancing effective and coordinated accounting methods for corporate water use and impacts is essential to help companies identify risk, drive improvement, and address stakeholders’ needs. The new report for the first time pulls together the main water accounting tools being used by the private sector and suggests where accounting methods might benefit from harmonization and increased field testing. The report focuses on the four primary methods and tools in use today: Water Footprint Network’s “Water Footprint”; Life Cycle Assessment; WBCSD’s Global Water Tool; and GEMI’s Water Sustainability Tools.